It is amazing how much can be accomplished with low-voltage lighting. JCMS offers the perfect low-voltage lighting solutions for every type of landscaping and every yard size and type. With the help of JCMS professional lighting experts, the perfect lighting solutions and the best beautification ideas are just a design away. Why Should I Use Low-Voltage Lighting? 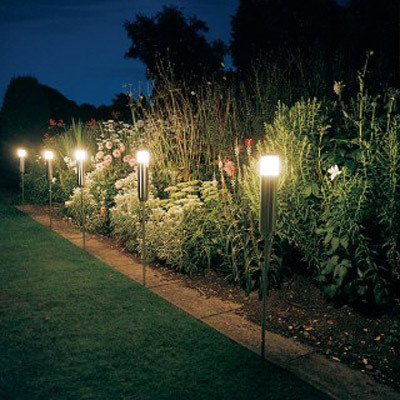 Low-voltage lighting has numerous benefits as a way for homeowners to provide continuous lighting for their yards and gardens. Because low-voltage lighting uses about ten percent of the voltage of a home’s outlets, it must be supplied through a transmitter that steps down the total voltage from 120 to about 12. Besides using much lower voltage, low-voltage lighting is extremely flexible in terms of the types of lighting that can be used with this power source. For example, lights that are recessed in canisters can be made to have a brilliant spot upon one small area or a soft, spreading glow that overlaps other canister lights. Like an adjustable shower head, the type of canister can make a big difference in how the light appears, and filters can further adjust the look of your outdoor lighting. JCMS offers Unique Lighting, which can be seen at www.uniquelighting.com. These fixtures and transformers use a hub system to balance landscape lighting. Unique Lighting features the iPad application QuickPro Designer. This great app allows JCMS professionals to instantly design a layout for landscape lighting and calculate both voltage drop over distance and wire size circuits for incandescent and LED lights. With the help of QuickPro Designer, Unique Lighting offers JCMS professionals one of the fastest and easiest ways to ensure that designs meet homeowner needs and expectations. When it comes to great landscape lighting, JCMS has what it takes to deliver professional results. Our professionals assess every situation and come up with the right solution for the homeowner’s needs. JCMS professionals can make landscape lighting look like it is part of the land rather than artificial light. JCMS lighting designs can highlight homes, pools, special plants, trees and other yard features. Pictures of some of JCMS’s great work is available at the company’s website at http://www.jcms1.com/san-diego-low-voltage-lighting.html. Contact JCMS today to learn how these professionals can work with you to create the perfect landscape lighting solutions and beautify your property through the use of low-voltage lighting solutions.